2 Bedroom Semi Detached For Sale in Bolton for Offers Over £160,000. ANOTHER PROPERTY SOLD!!! WE HAVE BUYERS LOOKING FOR SIMILAR PROPERTIES BEAUTIFUL, MANAGEABLE MODERN BUNGALOW WITH L SHAPED LOUNGE DINER, MODERN KITCHEN, TWO BEDROOMS, SPACIOUS CONSERVATORY. This WONDERFUL property is very well presented and easy to manage. Located just up from Eatock primary school, it occupies a generous plot whilst being in a pleasant family area within easy reach of bus routes, shops, cafes and local amenities. 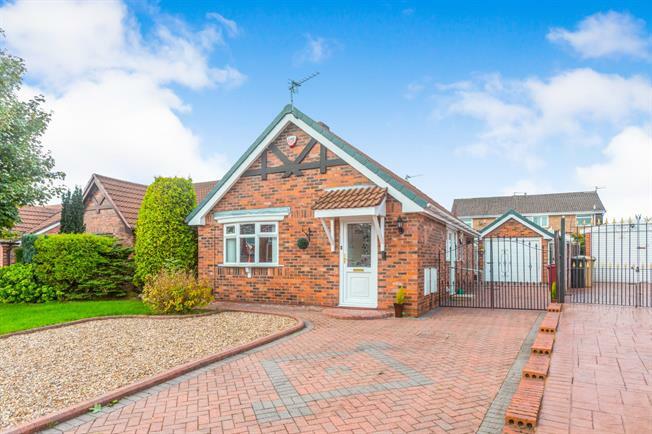 Externally there is a detached garage with lighting and power, brick paved drive, flagged rear garden and brick lights around the conservatory . Internally, there is a spacious and well presented lounge and dining area. The dining area is adjacent to the kitchen and semi open plan to it. To the rear there is a generous master bedroom and a second bedroom currently used as a sitting area, leading to the very large conservatory. The bathroom is very modern with white suite and tiles, shower and mosaic detail. A great home to move straight into and enjoy! UPVC bay window with stained glass facing the front overlooking the garden. Radiator and electric fire, carpeted flooring, ceiling light. Vinyl flooring, part tiled walls, ceiling light. Roll top work surface, wall and base units, single sink and with mixer tap with drainer, integrated, electric oven, electric hob, over hob extractor, integrated washing machine, dryer. Heated towel rail, tiled flooring, ceiling light. Low level WC, corner shower, vanity unit and top-mounted sink. Radiator, tiled flooring, ceiling light.